Floyd McKissick. Image courtesy of the North Carolina Office of Archives and History, Raleigh, NC. Floyd B. McKissick, a World War II veteran and graduate of the University of North Carolina law school, was one of the first to embrace the “black power” movement. Throughout the 1960s, he argued that blacks needed to separate themselves from whites and create their own businesses. “Economic power,” he said, “is the first prerequisite for political power.” Yet McKissick surprised his radical allies by joining the Republican Party in the late 1960s. He claimed that he did so in order to give blacks a voice within the GOP. Some, however, suspected that McKissick was simply trying to win support from the Nixon administration for his “Soul City” project. Soul City was intended to be an entirely new community, built from the ground up and populated by people of all races. It was meant as an alternative to crowded urban slums and sterile suburbs. McKissick wanted Soul City to be a mixed-use town, with houses, factories, and stores in one convenient location. He chose to build his self-styled utopia in one of America’s poorest counties: Warren County, North Carolina. Of its 15,810 inhabitants, 6,500 lived below the poverty line; its schools had a dropout rate of 44.7%; most people scratched out a living growing corn or tobacco. An undaunted McKissick still had grand dreams for Soul City. Within two to three decades, he expected Soul City to have 50,000 citizens and produce 24,000 jobs. The city would boast elementary schools, man-made lakes, and an “Afro-American trade center.” City planners named streets after African-American heroes: Nat Turner Street, Frederick Douglass Street, Sojourner Truth Trail. Previous attempts at building all-black communities—like Brooklyn, Illinois, established before the Civil War, and Promiseland, South Carolina, founded during Reconstruction—had failed, but Soul City had one major advantage over these earlier towns: money. McKissick secured a $14 million bond from the Department of Housing and Urban Development—perhaps in exchange for his support of Richard Nixon’s 1972 re-election. The state of North Carolina chipped in $1.7 million. Another million came from private donors. With this money, McKissick built a state-of-the art water system, a health care clinic, and a massive steel-and-glass factory named Soultech I. Donations alone were not enough. The city needed both inhabitants and businesses. Neither was forthcoming. A summer 1973 headline from the Soul City News spoke volumes: “Population Increases to 33.” Another serious blow came early in 1975, when Tom Stith of the Raleigh News & Observer wrote a hard-hitting expose of alleged corruption, nepotism, and mismanagement in Soul City. His story led Senator Jesse Helms and Congressman L.H. Fountain to demand an audit of the project. Soul City spent a year in suspended animation. Nothing could be built until the General Accounting Office (GAO) completed its investigation. The GAO cleared Soul City of any wrongdoing in December 1975. By then, the damage was done. No business—black-owned or otherwise—was willing to invest in a community under federal investigation. The money began to run out. So did the people. As of 1977 Soul City had only 80 black and 15 white residents. 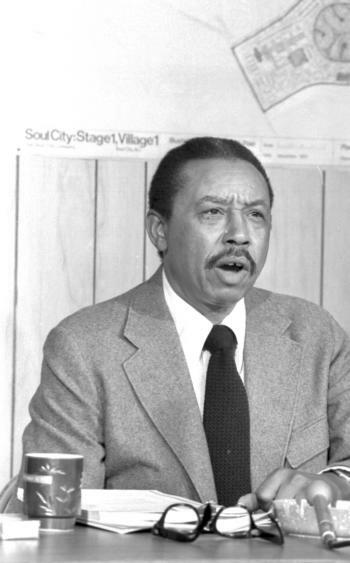 The Department of Housing and Urban Development, after studying the problem, decided to pull its support for Soul City in 1979. Though Soul City survived—today it is a small community with several hundred inhabitants—McKissick’s dream was dead. There would be no rural utopia, no shining city on a hill where blacks could live without fear of racial strife. Observers offer different reasons for its demise. McKissick claimed that the investigation unfairly tarnished Soul City’s reputation. Conservatives argued that the city was simply a government boondoggle. Whatever the reason, Soul City’s failure did much to discredit McKissick’s black power ideology.